There are a variety of common rashes that individuals may experience during their lifetime. Visit the pictures of skin rashes page for additional common skin rash information. 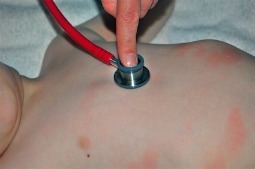 There are various rashes in children that can occur. The causes of these childhood rashes are quite broad. One of the most common types of rash begins in the early years of an individual’s life and that is the diaper rash. Diaper rash can be caused by a variety of factors such as stool and urine irritation of the skin, constant rubbing of diapers up against the skin, skin that remains moist for extended periods of time, a fungal infection, or sensitive skin. Viruses are a common cause of childhood rashes. The varicella-zoster virus causes chickenpox, the paramyxovirus causes measles, the rubivirus causes rubella which is also known as German measles, and the human herpes virus 6 leads to a roseola rash. Bacteria are also sources for the development of skin rashes in a child. Perhaps the most common is strep throat rash or it can be referred to as scarlatina or scarlet fever rash. Impetigo skin infection rash is fairly common as well in children and it is caused by the streptococcal or staphylococcal bacteria. A bacterium called Neisseria meningitides can lead to meningococcemia and a petechial skin rash. This is a rather serious health condition. Ticks are a common source of rashes in children because of frequent exposure to the outdoor environment while playing. Skin rashes caused by tick bites occur with Rocky Mountain spotted fever and Lyme disease. Mites result in a scabies skin rash. Ringworm is another type of skin rash that can affect children and is a fungal skin rash. Athlete’s foot is also a fungal skin rash that often appears in children. There are numerous other common childhood rashes. Rashes may develop due to exposure to a food allergen or an allergic reaction to an insect bite. Eczema and various forms of dermatitis occur regularly in children. Children are sensitive to heat and excessive sweating can lead to the formation of a heat rash. As illustrated above, there are many different types of skin rashes that can occur in children and trying to find the cause may be difficult. Therefore, it is very important to seek the advice of a physician when a skin rash appears on a child. 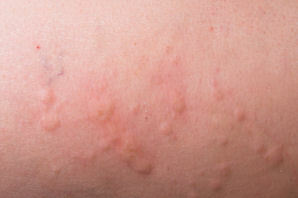 The rash may be due to sometime minor or it may indicate that a more serious health problem is occurring. Another common type of skin rash is caused by allergic reactions. Allergic reactions leading to skin rashes may be caused by the ingestion or injection of drugs such as penicillin or other medications or may even be due to reactions to certain ingested foods. Common food allergies are caused by eating nuts, eggs, and milk products, but when it comes to food allergies and individuals, any food may cause an allergic reaction and skin rash. Also, as individuals age, the body changes and foods that previously caused no skin rash and allergy may begin to cause problems. Common rashes are also caused by bacteria such as the strep bacteria. If you have strep throat, often a body rash accompanies the condition. Viruses causing skin rashes are also very common. Chicken pox or shingles are examples of common types of viral skin rashes. Other viruses that may cause conditions such as the flu can also produce common rashes of various types on the skin. Heat is often the reason why a rash occurs. A heat rash is very common when people are exposed to hot and moist conditions for extended periods of time and do not allow the skin and body cool. Stress can be a culprit in many health problems. It is often hard to directly relate stress to actual health problems, but it is a common source for a skin rash in many people. rashes caused by contact with certain plants such as poison ivy or poison oak.